Michelle has been blessed with never being over weight, yet has always had the concern of never wanting to gain weight… So there was always an insatiable curiosity to figure out the best way to eat to keep her body fit. There is honestly no one out there more enthusiastic to teach people on Eating Well. Although many factors fall into play, Michelle firmly believes that changing a current lifestyle on what one eats can really affect the mind, body and spirit. Current joint venture is with Dr. Matthew Weiner, Author, Bariatric Weight Loss Surgeon and Director of The Michigan Weight Management Institute at Huron Valley Sinai Hospital. Various course offering will be held throughout the year for clients to learn proper eating methods both pre and post surgery. 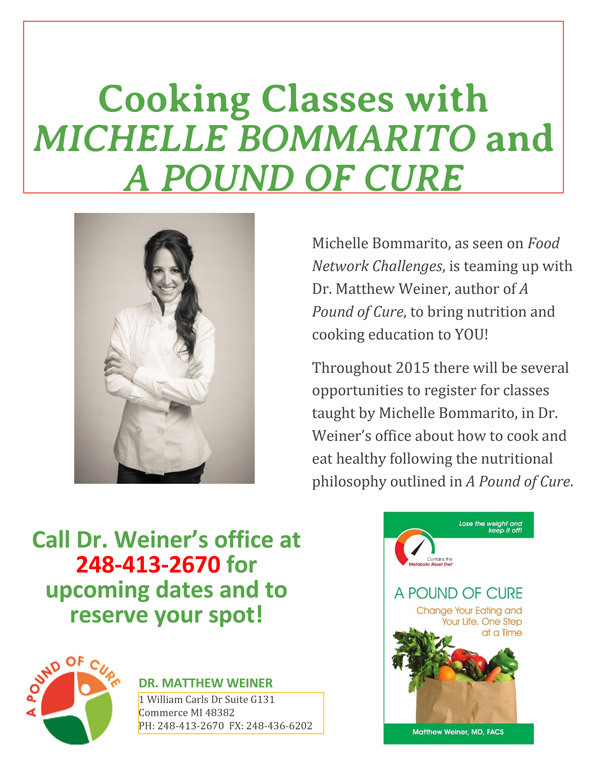 Classes will also be offered to simply better overall health without undergoing bariatric surgery.